Nearly 60% of independent research firms responding to a survey conducted by Integrity Research in December 2014 and January 2015 reported improved market conditions in 2014. 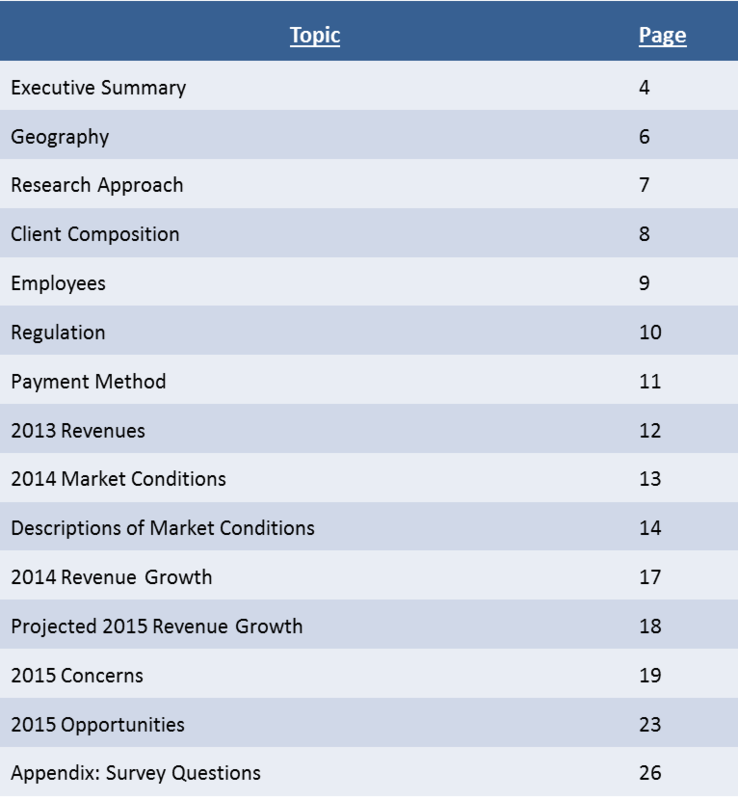 Median 2014 revenue growth for IRPs was 5% and respondents expected median growth of 10% for 2015. While IRPS see improving conditions, few were singing from the rooftops. The most common adjective used to describe the market was ‘challenging’ in large part because revenue gains are coming from market share increases rather than from overall growth in research spending. Integrity Research conducted a survey of sixty independent research providers in December 2014 and January 2015 through an anonymous online survey. Respondents reflected the diversity of independent research providers with over a third providing fundamental research and one fifth mainly providing macro research. Similarly, respondents mirrored the distribution of independents by size, with over two-thirds of respondents employing 25 or fewer full time staff. The majority (72%) were based in North America. The 28-page report covers current and projected market conditions for independent research providers and outlines major opportunities and challenges viewed by research providers. The cost of the report is $295.